Recently I had the opportunity to spend a week or so working from my parents’ home in Blackpool. 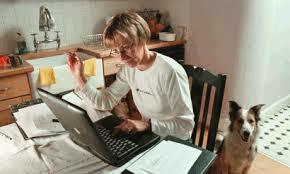 Off I race to do the dutiful daughter bit, laptop in hand – skype logins at the ready. We’d already put our systems on the cloud – so I thought – yay! I can be in two places at one time. For the main part it worked brilliantly. I could log on and work when I needed to and catch up with the off line stuff out of hours. It started me thinking about whether we all actually need offices to work in. Are we missing out on a candidate base that, for whatever reason, can’t make it into the office that morning, day, week – or even at all. There’s obviously the trust issue, is the work being done, are contacts being syphoned off to their own business, how long are they taking to do something – but surely that can all be covered by software and the calming down of our inner control freak. At the beginning of the week – it was great. I could fall out of bed, work in my pyjamas, then nip to Tesco’s with Mum (other supermarkets are available, but Mum doesn’t get to the big Tesco often), jump back on the laptop late afternoon, with one eye on The Chase, then knuckle down in the evening. So, would it be a viable option long term? Not for me. But for someone otherwise “stuck” at home, why not? Reasonable adjustments would be minimal, flexible working hours wouldn’t impact on the rest of the office, happy workers produce better work. My message? Don’t dismiss the idea of a candidate who needs to work from home – you may be missing the best person for the job.